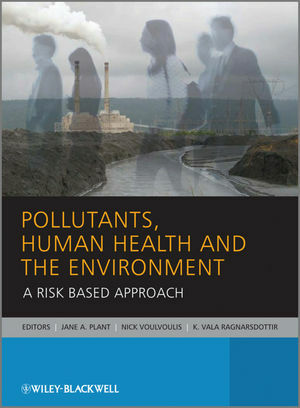 Pollutants, Human Health and the Environment is a comprehensive, up-to-date overview of environmental pollutants that are of current concern to human health. Clearly structured throughout, the main body of the book is divided by pollutant type with a chapter devoted to each group of pollutants. Each chapter follows a similar format to facilitate comparison and discussion. For each pollutant, the authors describe the sources, pathways, environmental fate and sinks as well as known toxicological effects. Importantly, the second chapter on heavy metals and other inorganic substances deals with trace element deficiencies which can have serious problems for human health. Some rocks and soils are naturally low in some trace elements and intensive agriculture over the past half century has effectively mined many trace elements reducing their levels in soils and crops. The final chapter is a discussion about the various risk assessment frameworks and regulations covering the main pollutants. Professor Jane Plant is a leading geochemist based at Imperial who has made major contributions to Earth and Environmental Science, concentrating on issues of particular relevance to society. Professor Plant is an international expert on chemicals in the environment, especially the naturally occurring radionuclides such as uranium and the trace elements arsenic and selenium. She developed the BGS Geochemical Baseline of the Environment (G-BASE) programme which maps the distribution of many different chemicals over the land surface of the UK and allows their interactions to be studied using geographical information systems or other digital methods. She developed the methods of systematically and reproducibly sampling and analysing sediment, soil and water samples, as well as the first quality-control systems for such data. The standard of the data is widely acknowledged as the best in the world, and the methods have been adopted by the IUGS/IAGC Global Geochemical Baseline Programme, which she leads jointly with the United States Geological Survey. She has used the data for many environmental studies, including issues related to human health and agriculture. She and her team have worked on problems related to human health in Asia and Africa helping, for example, to identify the relationship between a lack of available selenium in parts of China with the incidence of a type of heart disease.